Rotherham are interested in re-signing striker Alex Revell from Championship rivals Cardiff City, says Millers boss Neil Redfearn. 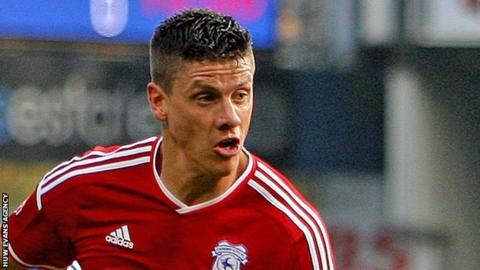 Revell, 32, moved to the Bluebirds in January last year and has scored twice in 15 league games. Redfearn said: "Alex is somebody we've looked at. There's been dialogue between the clubs, but getting players isn't as straightforward as it seems." Rotherham are fourth from bottom of the table, while Cardiff are ninth. Redfearn said Revell, who scored 28 times in 136 league matches for Rotherham, was "one of several [targets]." He added: "We're looking at quite a few players - we want to strengthen in that area. "He's somebody that did well for this football club. He's fondly remembered by the supporters here and I know he thinks that way as well about the club and the supporters." Revell has returned to the Bluebirds after a loan spell at Wigan, where he scored once in four league appearances.